The American Antiquarian Society has nearly 7,000 directories published in the United States before 1877. The collection, one of the largest of its kind, includes most of the earliest directories printed in North America. An astonishing amount of information is contained in directories, reflecting the growth and development of the country itself. 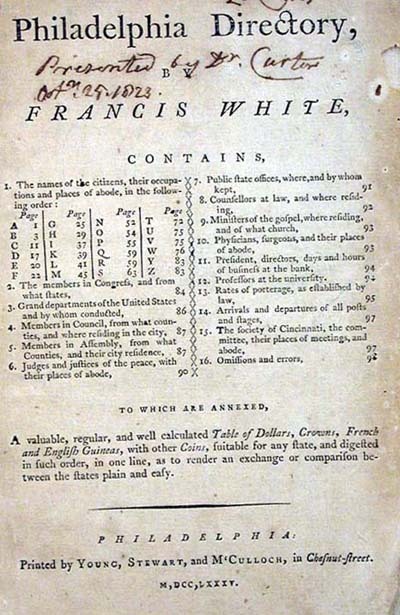 The first American directory, published in The South Carolina and Georgia Almanac for 1782, contained a list of 304 names indicating the trades or professions and addresses of the residents of Charleston, South Carolina. Three years later, in October 1785, Macpherson's Directory for the City and Suburbs of Philadelphia, was the first directory in the United States to be published separately. Beyond the expected names of citizens and businesses, early directories contained much additional information regarding local institutions and events. A map, or plan of the town, so that a "stranger" could find his way, was also included in other directories of the time. Within a short time, information became more copious and advertisements began to appear. In 1802, The Baltimore Directory... printed an abstract of the revenue laws, listed import duties, places of public worship and public buildings, and advertised land and water stages, pleasure gardens, and baths, etc. The collection of Worcester directories extends into the twentieth century. Some Canadian directories are included in the collection. There are also separately shelved collections of trade yearbooks and railroad directories, each having its own checklist located in the reading room. The yearbook collection is primarily concerned with subject rather than place. Thus it includes such titles as American Racing Calendar and Trotting Record, from September 1, 1856 to January 1, 1858, and Henry Chadwick's Baseball Players' Book of Reference containing the Revised Rules of the Game for 1867. City directories published before 1840 are fully cataloged online in the General Catalog using the genre term directories. For the period after 1840, access is available through the Society's annotated copy of the Dorothea N. Spear's Bibliography of American Directories Through 1860 (Worcester, Mass., 1961). A checklist of all pre-1876 directories, arranged alphabetically, by the name of the town or city, is available in the reading room. Directories published in the United States through 1880 are available on mircofiche in the Society's microform reading room. The Society's city directories were digitized by Ancestry. The contents are available through its interface. Spear, Dorothea N. Bibliography of American Directories Through 1860. Worcester, Mass. : American Antiquarian Society, 1961. Reprint. Westport, Conn., Greenwood Press, 1978.